1. The Situation: What does the term, "Black Tuesday," refer to? 2. Why did the stock market boom? 3. What were some signs of the crash happening? 4. When and where: What was the date of Black Tuesday? Where did the event take place? 5. 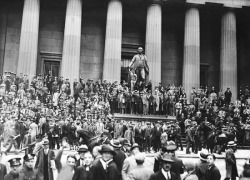 Great Depression: Explain how the Wall Street Crash led to The Great Depression? 6. Impact: How were people in the U.S. impacted by the crash? 7. Social Signifigance: Find a quotation that symbolizes the impact of this event. 8. Connection: Make a connection to our society today.